On 2 September 1705, Caroline and George Augustus married at the Leineschloss in Hanover. 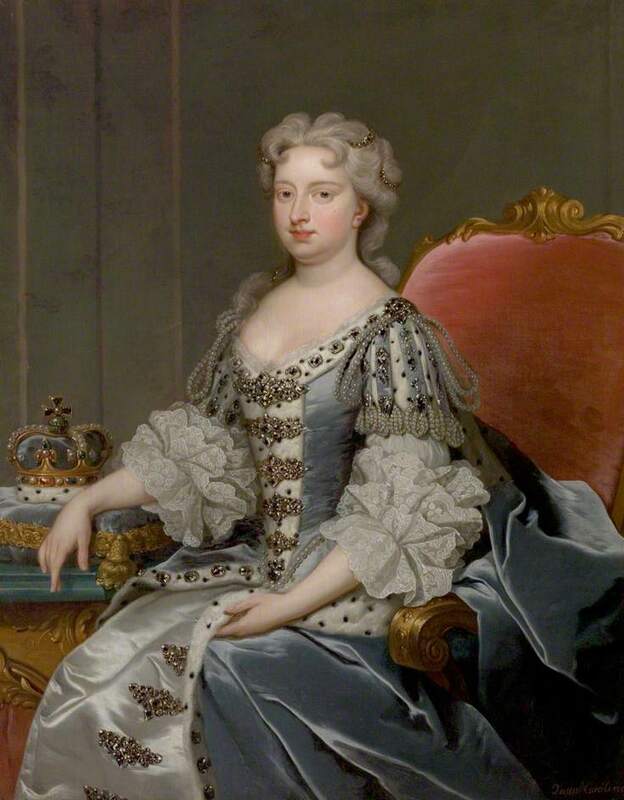 She wore a dress of coloured silks.11 The decade before the death of Queen Anne of Great Britain was spent in the domestic sphere for Caroline. 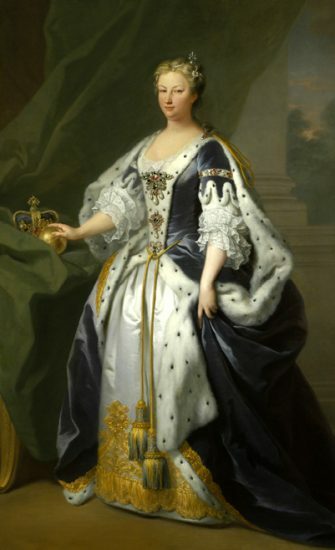 She suffered a phantom pregnancy during the first year of her marriage but on 31 January 1707, Caroline provided George Augustus with an heir. The boy was named Frederick.12 Six months after the birth of her son, Caroline contracted smallpox, and it took her nearly two months to overcome it. The damage to her appearance was considered by some to be minimal, though others found it greatly altered.13 Three daughters followed in quick succession, Anne in 1709, Amelia in 1711 and Caroline in 1713. At Leicester House, Caroline set up a court that rivalled that of her father-in-law, but for Caroline, it was a period of strain. 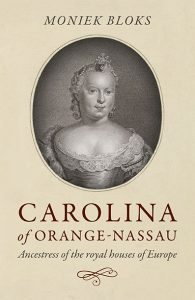 She had an annual income that was less than that of leading courtiers.16 Her father-in-law was determined to gain control over his grandchildren to Caroline’s horror. Her eldest daughter Anne wrote to her, “we have a good father and a good mother, and yet we are like charity children.”17 In 1720, Caroline was pregnant again, and she wrote simply, “I fear I am with child.” The stillbirth and the short-lived George William must have still plagued her.18 On 15 April 1721, Caroline gave birth to another boy named William Augustus. Two more children would follow, Mary was born in February 1723, and Louisa was born in December 1724 when Caroline was 41. Caroline’s recovery from Louisa’s birth took unusually long. She had suffered an umbilical rupture following the delivery, but the only one who knew was her husband, and she guarded the secret with her life. 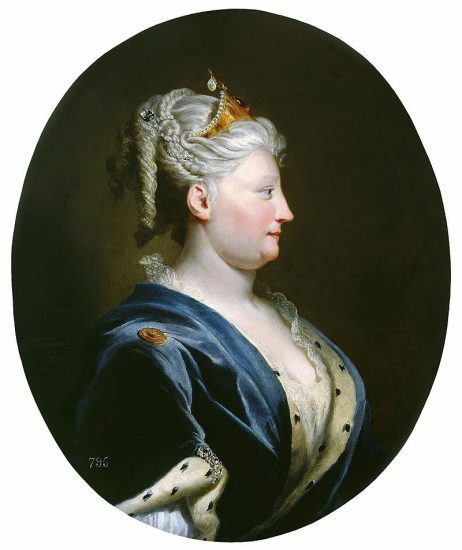 In July 1725, her 11th and final pregnancy ended in a miscarriage.19 On 11 June 1727, Caroline’s time as Queen came as her father-in-law died en route to Hanover. On 11 October 1727, she and George were crowned jointly in a service that followed the format of the coronation of King James I and Anne of Denmark.20 The court became established at St James’s Palace and Kensington Palace. After a separation of 14 years, their eldest son Frederick joined them in 1728.